Happy July 4th! This year, to honor the holiday, find something you can do-- large or small-- to better our families or communities. 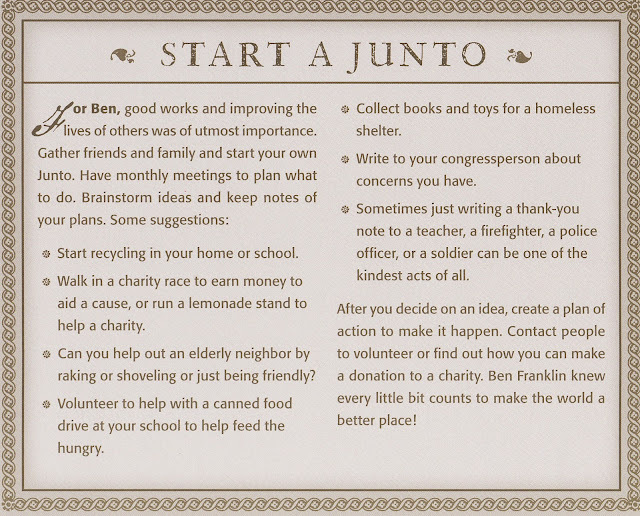 I'm inspired by that marvelous and practical Founding Father, Ben Franklin. Franklin works the printing press clad in his leather apron. Charles Mills Murals, Benjamin Franklin Institute of Technology. Franklin believed one man "may work great Changes, and accomplish great Affairs among Mankind, if he first forms a good Plan." A working-class poor boy with an eye for opportunity, Franklin always had a plan. Still in his early twenties, outgoing Franklin was the ultimate networker. How could he share knowledge and learn from others? In 1727 Ben formed a group called the Leather Apron Club. A leather apron, stained, scratched and worn thin, represented the hardworking craftsmen, like Franklin himself, who wore the garment. Soon the group's name changed to the Junto, meaning an assembly or council. In weekly meetings Junto members traded ideas and information and pooled their books for everyone to read. Any topic could be discussed. How might members help each other to succeed and better themselves? What had members learned from a success or failure? How could they make their home of Philadelphia a better place? This last part was important. Franklin believed "the most acceptable Service of God was the doing of Good to Man." 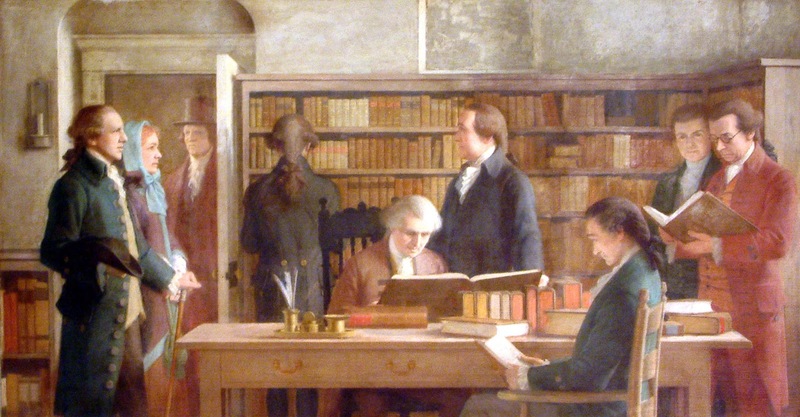 Franklin (center) works at the first lending library. One of Franklin's earliest civic projects (1731) established the first lending library in the colonies. People checked out books in exchange for a small fee which covered the cost of buying new books. 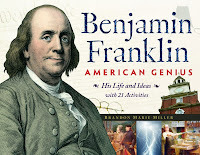 Franklin proudly believed the library (and others that followed) made America's "common Tradesmen and Farmers as intelligent as most Gentlemen from other Countries." As a writer, I thank Ben for this achievement. 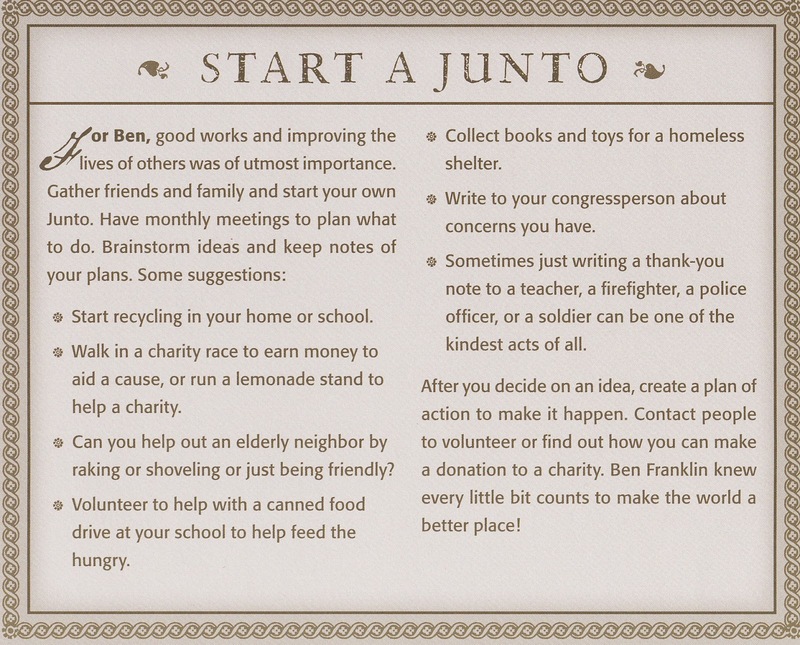 What ideas can you brainstorm to celebrate Independence Day with a good deed, for every little bit counts! Love this! It encourages kids to do more than just read about a famous person. They can actually get inspired and take action! Thanks, Diana! That is exactly what I hope! Love Ben. He was also one of the first to implement refuse collection in the streets of Philadelphia! Sarah-- wouldn't it be great if we could sit down with Ben and have a nice talk? I need a time machine!